Last updated: August 14, 2018 by Rootwell Products Inc.
Are you looking for a way to have a low maintenance garden? Everyone wants beautiful, lush plants to frame their homes. We all love color and texture and variety to see from the windows and when we pull into our driveways at night. And if you love to garden, every plant is enticing, no matter how needy it seems. The trouble comes when all those plants start to thrive. It’s not only the plants we want to grow which thrive. Weeds thrive. Then you need to deadhead, divide, mulch, water, feed, and trim back your plants. In addition, you need to maintain your grass. The truth is unless it’s your full-time job, most of us don’t have time to do all the work required to keep needy plants happy and looking good. Are you tired of having a garden that looks ragged and weedy all the time because you can’t get to it? How about a lawn that looks ratty if you forget to feed it or don’t have time to take out all the weeds by hand? Don’t want to use fertilizer and herbicides? There’s a better way, and it’s starting to become more popular as more and more people become more educated about plants. Also, the attitudes about gardens are shifting. The gardens of the past were about control. 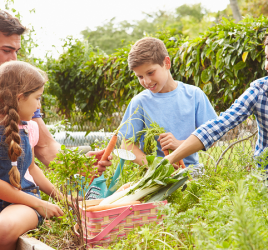 It was the mark of a good gardener to be able to keep a family of plants thriving even if they didn’t thrive under normal circumstances either in their environment or together. Now that most families have two working parents and people are working full-time jobs for longer, it makes sense that we would want a change. I’m here to tell you it is okay if you don’t want to maintain those bulbs that need to be divided every year. You don’t need to hold on to that fussy perennial you inherited just because it was there when you moved in! And if you have so many weeds that you can’t keep up in the spring, the answer is that you don’t have enough plants! That’s right; more plants can equal less work. The trick is, which plants do you keep? Much of the trouble comes in when you choose plants that aren’t suited for your climate. The first rule of thumb, therefore, is to choose the perennials that grow in your area naturally. Either that or choose plants that are native to another area of the world that has a climate like the one where you live. Here is only a partial list of some low-maintenance plants that do well in a variety of climates. 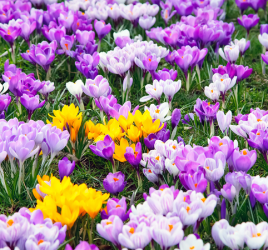 When it comes to changing your overall strategy for garden maintenance, there’s more to it than just giving away the bulbs that need dividing every year. Take a minute to look at your yard and think about which parts are the most work and why. Do you have a patch that looks beautiful for a week and then needs deadheading and pruning and weeding all summer? That’s where you should start. The simplest thing to change is the number of plants and the size of your plot. You can cut down on weeds by adding more low-maintenance plants. Many of the plants listed above may have beautiful blooms once in the season but are still lovely once the blooms have died away. Or you can fill in the spaces in your garden with grasses that need no watering or pruning. Just make sure you choose a variety that won’t take over your whole garden. Another good strategy to eventually cut down on yard maintenance altogether is to enlarge your flower beds and plantings under your trees to cut down on the amount of grass you have to mow, edge, fertilize, and water. This is especially true if you have big trees where your grass is always going to struggle to grow. A wide plot of shade-tolerant plantings under the trees can be connected to your flower beds by a gravel walkway instead of grass. You can spray your gravel walkways with vinegar to kill the weeds for a year or more, without hurting the environment. Larger flower gardens, planted with low-maintenance perennials, will give those big plants room to spread. You can combine this with groundcover to go almost maintenance-free. If you love exotic plants and annuals, consider bringing a few inside. Plant your annuals in pots by the door and love them for the short season. However, for your yard, choose plants that are going to look good all season long and don’t need deadheading. 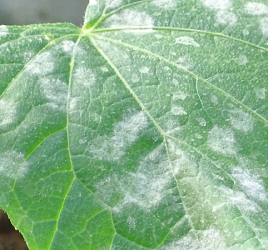 Look for plants that are naturally disease-free, or are bred to be disease resistant. Make sure they won’t become diseased if they are in the wrong conditions (i.e., desert plants in a wet environment). Look for plants that like the temperature range and precipitation in your zone. Don’t buy a plant that will need to be staked. Make sure you aren’t buying something that will take over your whole yard! Use compost and manure if you can. Instead of feeding your plants, first make sure your soil is the highest quality before you plant, and they won’t need many applications of fertilizer – if any. Mulch more than you think you should! 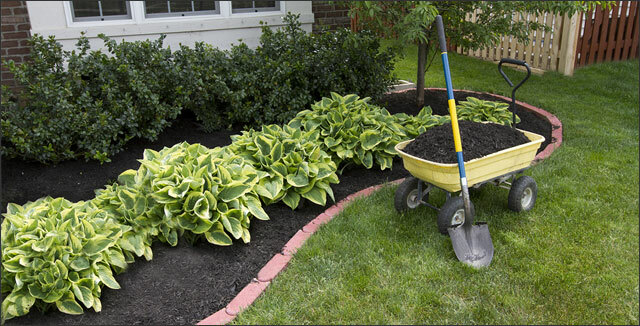 Work a thick layer of mulch – more than 6 inches – into your topsoil to keep weeds at bay. Of course, this works best if you have already selected plants that are hardy for your area and your soil is of good quality. If you want to start making your garden beautiful, lush and low-maintenance, you can start right away by amending your soil and adding more low-maintenance grasses, shrubs, and perennials to discourage weeds. Give away your high-maintenance bulbs and keep annuals on your porch. Make those flower beds bigger and let them stretch their legs and they will look beautiful all season.